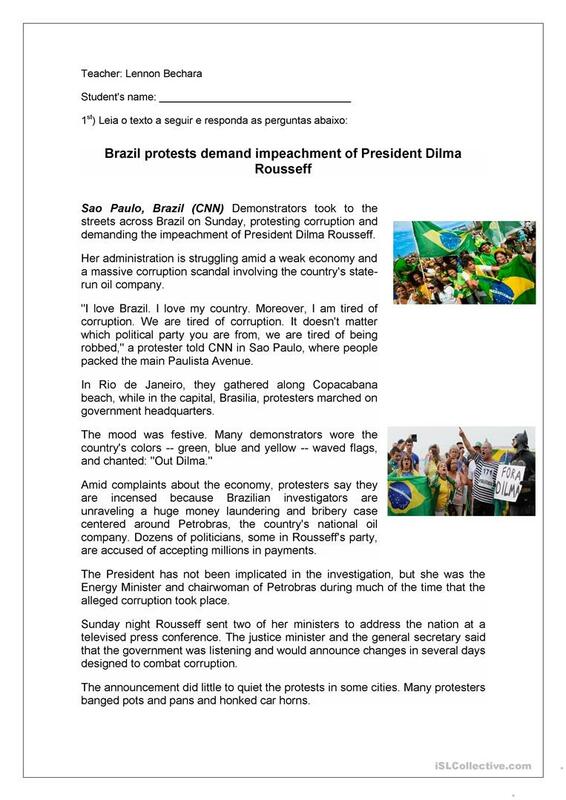 This worksheet deals about the Brazil Protests that happened this year on March 15. I made this activity with my 9th grade students, there are some questions about the text, but you can create some questions according to your background or even according to your students. The reference of this activity was the website CNN, after the text you have the link that you can check this news or even others. This downloadable teaching material was created for high school students, elementary school students and adults at Elementary (A1), Pre-intermediate (A2) and Intermediate (B1) level. It is great for revising Questions: Subject questions in English, and is a valuable material for improving your learners' Reading and Writing skills. It features the topic and words of Countries.